Thread 6 skewers with the following: a wedge of lemon, green prawn, red or yellow sweet pepper, another prawn and finish with a wedge of red onion. Combine olive oil, lemon juice, salt and garlic in a long container that will accommodate the skewers. Soak the threaded skewers in the marinade for a minimum of 1 hour in the fridge to allow the flavours to soak in. Heat the BBQ and cook skewers on either side until the prawns are cooked and the peppers have softened, then serve. 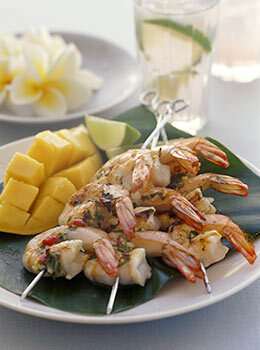 Chef’s Tip: The lemon on the top of the skewers makes a nice dressing if squeezed down over the prawns.